Law enforcement dogs provide our communities and our families with unmatched protection from criminals and terrorists. With their incredible sense of smell, these dogs are the most effective method we have to detect explosives, guns or nuclear material being smuggled into the US by terrorists. These dogs can catch arsonists, find illegal drugs, have detected tons of illegal drugs and dangerous agricultural products from being smuggled across our borders. These dogs also apprehend thousand of criminals every year and guard sensitive government buildings. Despite all they do to protect you and I, law enforcement agencies across the nation are begging for our help so they can give these dogs the care they need. Every year over 10,000 dogs who work for police, sheriff and highway patrol departments, homeland security, the FBI, and countless other law- enforcement agencies retire. They are too old to do their jobs. And these agencies aren’t required nor do they have the money to care for the dog after retirement. Typically the dog’s handler will want to adopt the dog and take them home as a pet. Unfortunately, this adoption process is getting harder and harder because a law enforcement officer with a family often can’t afford the veterinary bills — often up to $2-3000 per year — for an older dog who has worked and often sustained injuries while doing their job. What’s more, while active duty law enforcement dogs are permitted by law in most rental housing, a retired dog does not have the same protection. So, handlers who wish to adopt their dogs must often move from their homes because pets are not allowed and they frequently struggle to find a new place to live with their dog. As a result of the cost and many obstacles that get in the way of adoption, many retired law enforcement dogs – we don’t know how many – end up in a shelter. Sadly, we’ve heard of cases where these dogs are even put to sleep because there is no one to care for them. 1.) Recruit and negotiate with veterinarians, dog food suppliers, and other service providers to provide free or discounted services to law enforcement officers who have adopted retired dogs. 2.) Help pay for medical care for retired law enforcement dogs. 3.) Negotiate with landlords to allow handlers and their retired dogs to remain in their rental homes or apartments. 4.) Work to give retired law enforcement dogs the same rights as service dogs who can live anywhere with their owners and accompany their owners into all public places. 5.) Raise awareness about the effectiveness of these dogs in protecting our country from terrorists and our communities from crime. 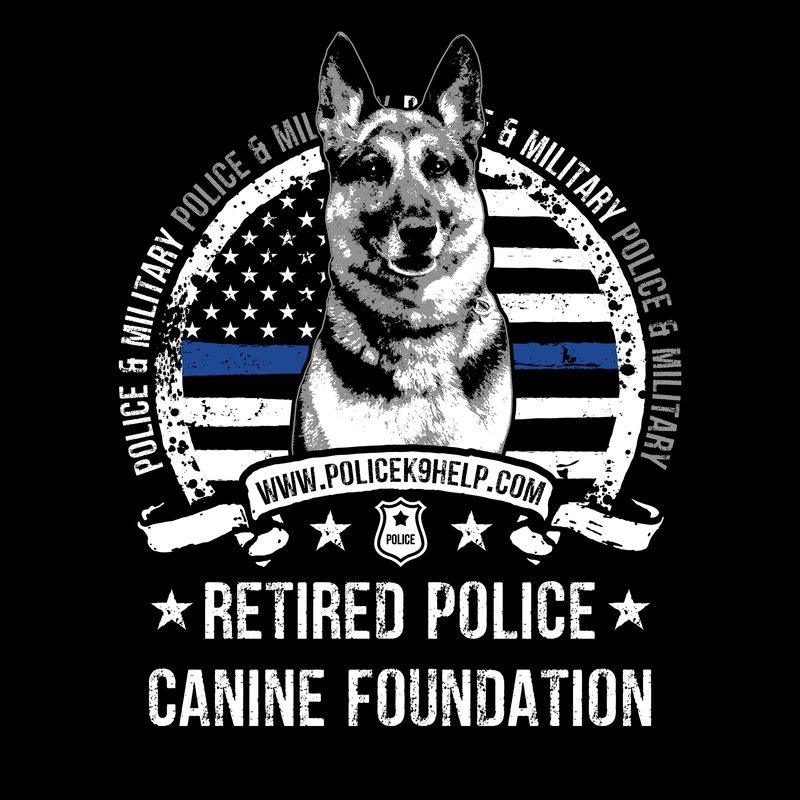 Help The Retired Police Canine Foundation with our important work and Donate. Attention Handlers: Retired Police Canine Foundation is starting a chip registration program where we will be registering any retired K9s for free with our new partner Michaelson’s Found Animals. Contact Us ! Attention Handlers: Contact Us ! We will help negotiate lower prices or reduced balances due at your local veterinarian for medical care for your retired dog. We will also speak to your current or prospective landlord to allow your retired dog to live in rental housing. Retired Police Canine Foundation has partnered with Healthy Paws to provide discount pet insurance for our supporters! Please contact us for details. Click below for supporter pricing.